Dogs are social creatures and can very easily turn into bored puppies. Boredom prompts dogs to find interesting things to do. But what's great fun for the dog can often be destructive to your home and even dangerous for your pet. The signs of canine boredom aren't hard to spot, but dealing with the behavior may present a challenge to the busy owner. Unless you have kids or other dogs to take up the slack, it will be up to you to figure out ways to get your pup to refocus its energy into more productive outlets. Problem behaviors that are practiced repeatedly become ingrained and can be more difficult to stop. So it’s important that you give your dog lots of opportunities to express itself in positive ways. It's just as important to make sure you teach your pup early on what behaviors aren't acceptable. A puppy that's introduced into a multi-dog household has the advantage of having playmates to hold its attention. Of course, bored youngsters may also pester and annoy an older dog. Keeping solo pups entertained always falls to the humans in the house. Engaging appropriately with your pup not only keeps it physically active and healthy but also stimulates its brain in productive ways through training and play activities. 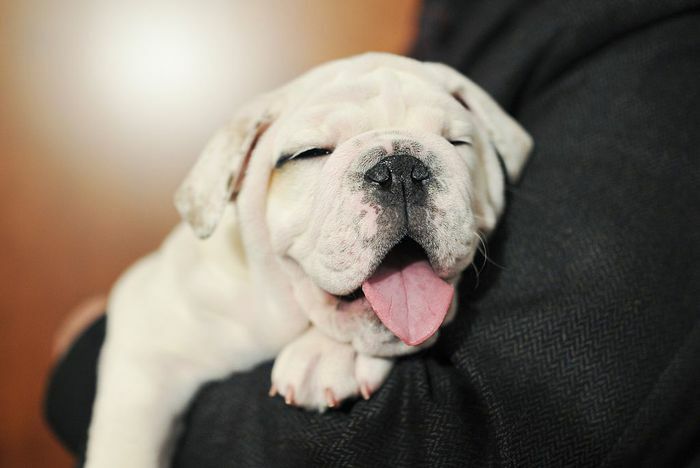 Most dogs want a job to do and are happiest when they’re busy. It’s up to you to find ways to keep your pup occupied. A puppy that's bored when left alone in a fenced yard, for example, may turn to barking to burn pent-up energy or just to hear the sound of its voice. Another dog may decide to dig its way under the backyard fence to seek more exciting things to do. Digging is a common sign of boredom and one of the tougher canine habits to break. 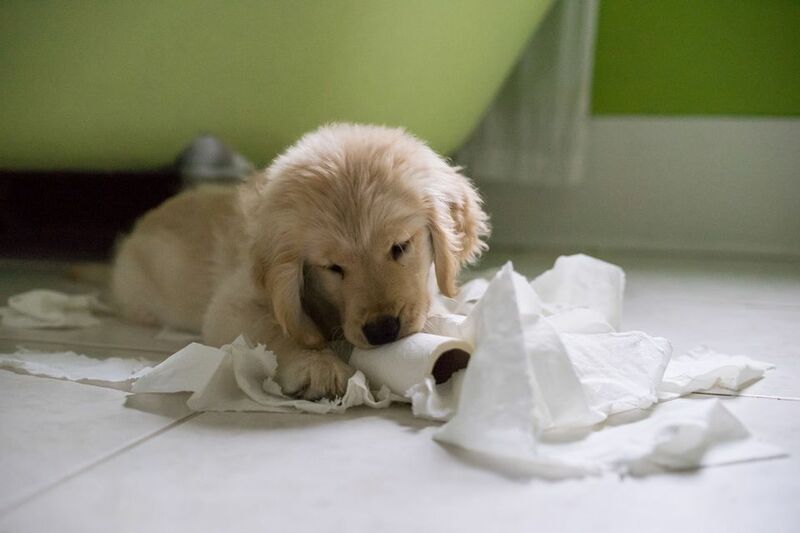 A dog or puppy often chews out of boredom, which can get it into a heap of trouble when it doesn’t have access to enough suitable objects to chew. You know your dog best. Try a few different strategies to stimulate your dog. There's no harm in trying a few techniques at once. It's likely that actively aiming to stop the boredom will help. Puppies get bored with the same old toy day after day. If you have multiple dogs, be sure each has several toys. Aim for three to four minimum per pet, so they don’t need to argue over them. For a singleton pup, eight to 10 toys are even better. Rotate the toys to keep them fresh. Set up a schedule and swap out the toys every two or three days. Offer puzzle toys like the Orbee Tuff Mazee that engages the pup’s attention for long periods. The types of toys that have places to hide treats are big favorites. You can rotate the kind of treat for even more boredom relief. Peanut butter, liverwurst, cream cheese, and commercially produced treats all work. Provide "legal" chewing opportunities as well. For example, teething puppies need something to gnaw to relieve tender gums, but a dog of any age may engage in chewing to relieve stress or boredom. Rawhide chews, dental chews, and other canine safe chew-options like sterilized bones (if your veterinarian approves) may offer a more suitable outlet as long as you're there to supervise. Terriers love to kick up dirt. Without an outlet, a bored terrier may unplant your potted palm in search of dirt. Forestall this by providing a sandbox and hiding some favorite toys for your pup’s excavating pleasure. If it has a place where it's permitted to dig, your dog will be less likely to try to dig where it can do damage. Your dog may enjoy hearing music or watching a video. Tune the TV to an animal program so your pup can enjoy squirrel antics when you must go out. Another option is caged pocket pets, like hamsters, mice, fish, or birds, may also be fun viewing for the bored pup. Just be sure the smaller critters are safe and not stressed by the staring, yearning attention of your puppy. Nose work can also keep your bored puppy out of trouble. Sniffing out rewards engages the pup’s senses and puts its paws to work as well. Create a canine treasure hunt while leaving Hansel and Gretel smelly crumbs to follow in order to find the reward. Hide stuffed Kongs or dry dog biscuits around the house (or yard) before you leave for the day. Be sure to pick them up so bugs won't find them if your puppy fails the sniff test, though. The first time, show your dog where you hid the treats, but after that, its nose will do the rest. This works particularly well with hunting dogs such as golden retrievers and Labradors. It’s best to separate a new puppy from an adult until you’re sure everyone gets along well. But if being alone leads your puppy to wail and howl, install a baby gate that keeps the dogs separated but allows them to see each other and not feel so lonely and bored. This may also cut down on barking, scratching, or digging at the door. Planning ahead to keep your pup entertained can prevent boredom that breeds bad habits. And that has a tendency to keep everyone tail-wagging happy.